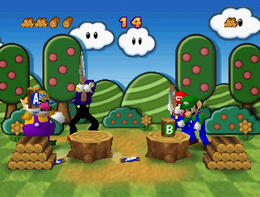 Log Jam is a 2-vs-2 minigame found in Mario Party 3. The name comes from log jam, which is when pieces of wood pile up in a river. One player in the team attempts to place the logs correctly by pressing the correct button while the other player attempts to chop the logs correctly the same way as the chopper. If a player does not place or chop the log correctly, they struggle and lose time. The team that places and cuts the most logs wins. Game Rules - "Press the button displayed on each log to split as many logs as possible." Advice - "If you press the wrong button, you won't be able to place or split logs." This page was last edited on December 31, 2018, at 16:32.